See more objects with the tag interior, furniture, children, seating, woven, chairs, curved, curving line, multipurpose, wood, texture, bent, smooth, children's, movable. See more objects with the color sienna peru saddlebrown rosybrown or see all the colors for this object. This is a Child's chair and tray. 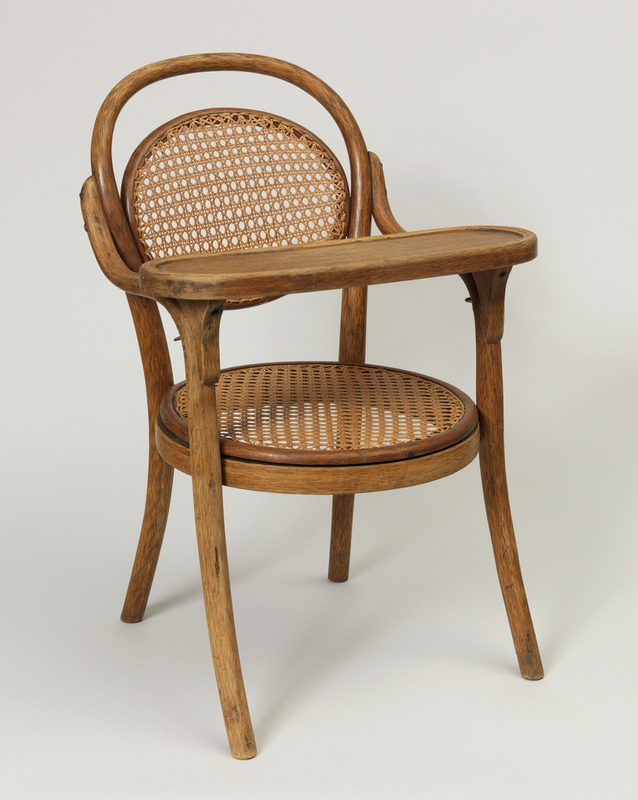 It was manufactured by Gebrüder (Brothers) Thonet. It is dated ca. 1886 and we acquired it in 1989. 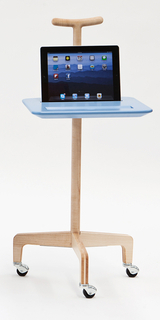 Its medium is bent wood, caning, metal. It is a part of the Product Design and Decorative Arts department. This object was donated by Sol Chaneles. It is credited Gift of Sol Chaneles. 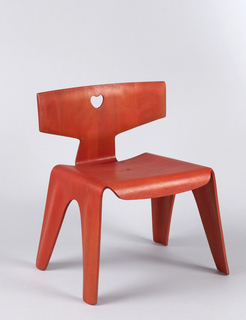 molded laminated plywood, red stain. Label glued to inside of seat rail: "New caned seat tops with which to repair this chair can be produced from our dealer or direct from the manufacturer. Simply pry off the old seat and tack on the new. When ordering state style number and finish" Label glued to inside of seat rail for Thonet outlet at "860 Broadway, corner of 17th street"